COLD SPRING, Ky. -- Cold Spring artist Connie Goldstein can talk about her "magical" stone house, its surrounding three acres of grass and old trees and its rich history for an hour without offering a word about herself. 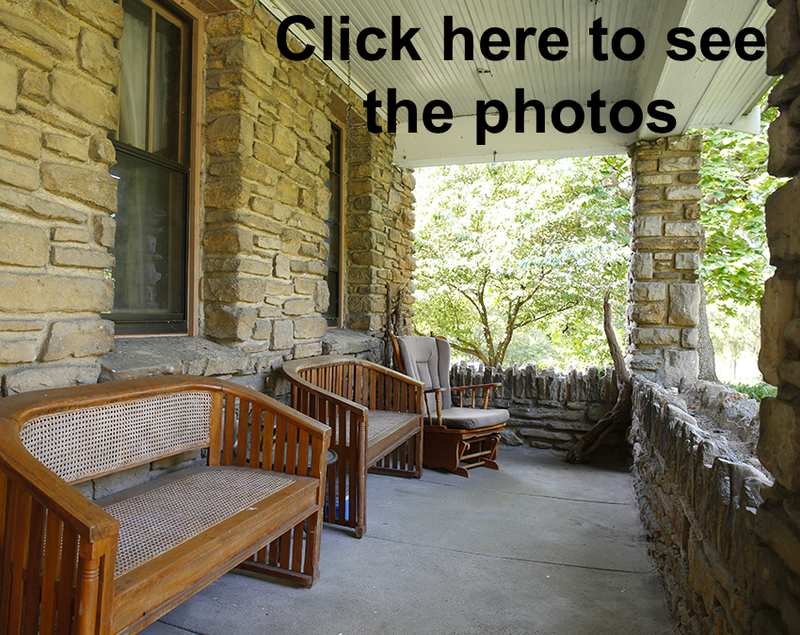 There's the story about how the Craftsman house was built with limestone rocks culled from Pooles Creek about 90 years ago by the 13 children of mason and farmer Joseph Geiman and his wife, Rosa Keller. "The story goes that the kids, on their way back from school along the horse path, were told to bring a rock from the creek," Goldstein said. "Those were the stones that made this house." Geiman, however, didn't stop with the house, where the living room fireplace is made of rounded river rocks and mortar that's raised like a leaded-glass window. He built a low, curving stone wall from the east side of the house out to Pooles Creek Road, where he framed the driveway entrance with four mushroom-like posts. Geiman also built a broad round-top staircase of stone that links the driveway and path to the front door. His masonry skills show up in the back, as well, in the form of a jagged-top, trenched wall in which Goldstein planted a sedum garden that adds life to the 25-foot by 15-foot concrete porch. Other lore Goldstein has learned since buying the house five years ago with her late husband includes how rivals shot at the house in attempts to disrupt Geiman's alleged bootlegging operation and that, one day in 1966, he lay down on one of his walls, looked up into the sky and died at age 82. These stories, the trees Goldstein has assigned names (Old Man Cedar, Mama Catalpa and Marie's Oak, for her grandmother), and the sunsets that splash her bedroom walls make it tough for her to sell what has been like a vacation home for her. But it will be on the market soon at an asking price of $225,000. Although the footprint and architecture of the Geiman House is shared by many blocky Campbell County homes built by the German stonemasons who fled their native land's civil strife around 1850, its interior is American Arts & Crafts. That style starts with the classic wood front door and continues throughout the house with dark-stained pine door, window and baseboard trim. Although the 1,400-square-foot house was built in the early 1920s after the Arts & Crafts era had given way to art deco, features such as the French doors between the living and dining rooms and central, enclosed staircase speak to an earlier day. Guests enter into the faux-painted living room. To the left is a compact but full bathroom with a tub. Beyond that, a door leads to the kitchen, which, Goldstein acknowledged, is small and outdated but cozy and sunny. It includes an ample pantry closet with a vintage Pepsi bottle opener that she said reminds her of growing up playing in her grandparents' farmhouse as a child in Illinois. A second door off the kitchen leads to an enclosed deck, where Goldstein enjoys the morning sun with her morning cup of coffee and dog, Jazz. The house showed plenty of wear when she bought it, but Goldstein said she found the original features so charming she was reluctant to touch them. "I saw this house and we came back the next day," Goldstein recalled. "Even though there wasn't an open house or anything, we walked up into it. We made an offer the next day, because this house is so magical you can just feel it." Goldstein said she still senses the marvels of her house, one example being the center of the stone steps from the side porch to the kitchen that decades of children's feet have polished. A friend pointed out that she could polish the rest of the steps, but she refused to wash away the house's history. She hasn't refinished the hardwood floors and even kept the corrugated black, white and red linoleum treads on the stairs that lead to four corner bedrooms and a bathroom with a shower on the top level. All the bedrooms have ceilings that slant with the roofline, but dormer windows in the two at the front of the house add charm. Thinking about the 15-member Geiman family sharing a space a woman and a dog have all to themselves gives the house a strong sense of love and family, Goldstein said. Goldstein's three acres are surrounded by Pooles Creek Road on the north, an adjacent residence on the west and forest on the east and south. The creek runs through the southside forest, but a steep bank protects the property from occasional flash floods. The grassy part of the yard is manicured in the front and rustic in the back, where one wide path leads into the trees, past what the Geiman kids called Spooky Woods to the Secret Garden. Trees range from pine and cedar to maple, oak and one mighty sycamore on the west side. A rope swing like one Goldstein played on as a girl dangles from Marie's Oak, and there are vintage horseshoe stakes in both front and back yards. Goldstein said she had options as to where her property line would be when she bought it and purposefully drew the southern border into the floodplain across Pooles Creek so no one could build near it. "It's so peaceful here, so beautiful," she said. "It's a paradise."